Sometimes incorrectly called 'Blue Lobsters'. Lobsters are the saltwater variety. Male has two extra short appendages at the rear of the back legs. Female has none. After growing over an inch in length, the claws can typically be used to distinguish between males and females. A male has elongated claws compared to a female's claws. Aggressive. Do not keep with fish or smaller invertebrates, species tank only. They will eat almost anything they can get their pincers on. But not too much fat. They will eat vegetation, sunken fish food, shrimp pellets, small fish, slow shrimp, and worms. Also try small pieces of carrots and peas. Feed food which is high in Iodine as this helps it moult. Kelp tablets are one source. It requires hard hard water to develop its shell correctly. 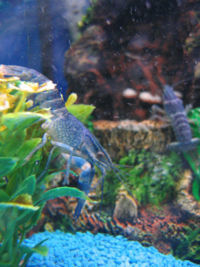 Crayfish are well known to climb out uncovered aquariums, so make sure that your aquarium is escape proof. Crayfish like being hidden, so give them a cave or some kind of shelter. Crayfish will eat small fish and large fish, like Oscars, eat them. Small fish can harm crayfish when they are moulting due to their very soft skin. Other crayfish (and crabs of small size) can be put with crayfish if they both have more than one cave/shelter. But if you do put them with another crayfish (or crab) there is always a chance one will be eaten during moulting. The blue form is the most commercially sold variety. In the wild they will be found also in a more natural dark red-brown. This cray is unlikely to be found for sale outside of the USA due to strict exportation laws on crayfish, and is in fact illegal to keep in several places outside the USA including the UK due to their invasive nature. This page was last edited on 14 November 2017, at 05:03.